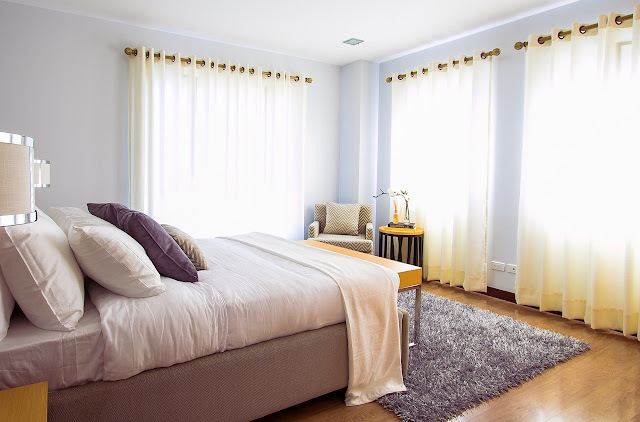 Everyone dreams of coming home to the perfect bedroom: a comforting, peaceful place to escape to after a long day. Whether you’re exhausted from your eight-hour shift, overwhelmed with school work, or just need to give yourself some good old TLC, your bedroom is the one place that should promise serenity and relaxation. Here are five simple ways to create that safe haven you’ve always wanted. Once you've found the perfect bed set, it’s now time to take it to the next level. Pillows of any size can help you achieve this. Who says you only need one or two? The more, the merrier (to a certain extent, of course). In addition to pillows, throw blankets are, without exaggeration, the epitome of coziness. They're soft, comforting, and aesthetically pleasing. Throwing a small blanket on top of your bedspread can instantly add that cozy feel you’ve been looking for. You can even throw one over your desk chair for a chic, modern touch. As one can infer, your bed is the centerpiece of the bedroom. Luckily, making it the star of the show is super easy. Bed sets and comforters come in all different shapes, sizes, colors, designs and patterns. Whether you’re a minimalist, monochrome, or colorful pattern type of person, the perfect bed set made especially for you is out there somewhere. A great site to start looking at is Threel, where they have tons of options to choose from. Sure, overhead lighting is practical, but it’s not always the most comforting when you’re looking to wind down. Hanging some holiday lights doesn’t have to be reserved for the end of the year season; they can be a beautiful addition to your room that solves that never-ending problem of finding the perfect medium between bright light and pitch-black darkness. Not sure you want to go all out with the lighting? A simple lantern or two can also spice it up and provide an extra sense of comfort. Nature never fails to provide us with a sense of peace and wellness. Because of this, adding a small plant or two to your desk or dresser can be the perfect way to cozy up any space. Small room plants are praised for being low-maintenance and pleasing to the eye. Don’t have much of a green thumb? No worries, you can always opt for artificial plants to satisfy your need for a touch of nature. Comfort and coziness doesn’t solely appeal to sight; some of the best feelings in this world can be felt by our sense of smell. This makes it especially important to ensure that the smell coming from our bedroom is a good one. Lighting a scented candle is a great way to cozy up your room. If your space is small and having an open flame isn’t the most appealing choice to you, you can always choose a plug-in air freshener that’ll get the job done just as well. There you have it, five super easy ways to transform your bedroom into a place of peace and comfort. Utilize these tips to create the ultimate place that’s so cozy, you never want to leave.